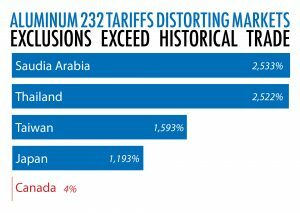 China – the very country at the root of the global steel and aluminum oversupply problem – has been one of the main beneficiaries of the Section 232 tariffs. 1 – The Department of Commerce has excluded far more metal from China than from allies like Canada – both in absolute terms and as a percentage of historical trade. 2 – Downstream North American manufacturers are losing contracts for finished products to offshore suppliers due to uncertainty in North American steel and aluminum markets. 3 – China’s oversupply has increased since the tariffs were imposed – with Chinese crude steel production increasing 6.6% in 2018 to 928.3 million metric tonnes. 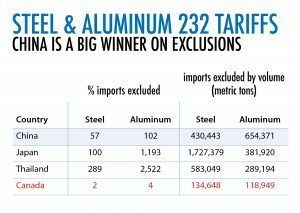 Learn more about how China is winning and why Canada should have an immediate and permanent exemption to Section 232 steel and aluminum tariffs here.